Central Catholic FS Ja'len Johnson is one of the most underrated safeties in the whole state and at the same time, he is one of the best in the entire state. Johnson can start for any team in the state whether it be a 1-A team or a 5-A team. Johnson is a big safety at 6-3, 200 pounds, can run a 4.5/40, and will hit you hard on every play. Plaquemine offensive lineman Abraham Delfin is one of the best offensive linemen in the state of Louisiana. 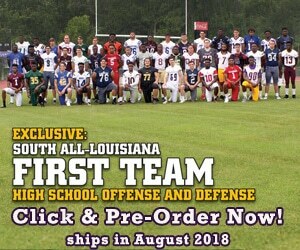 Delfin is on our 2nd team All-Louisiana Team which proves that he is one of the best at what he does. If you have seen Abraham Delfin and talked to him in person, you would think that he is a normal guy that has played football his entire life and that his family has been around the game of football, well you would be surprised what Delfin's story is all about. Jason Holliday is one of the best pure athletes in the Baton Rouge area. Today's recruiting interview is on a very underrated offensive tackle named Tre'Veon Alexander from St. Martinville High School. LAFM TV 11th Season Kicks Off Today! September 13, 2016	Comments Off on LAFM TV 11th Season Kicks Off Today! When you look at two sport athletes, you look at Bo Jackson (NFL and MLB) or Deion Sanders (NFL and MLB). Now a days, there are not many athletes who play two sports at the next level. When an athlete usually excels at two sports, that athlete will ultimately have to choose one in the end. That is usually the case but do not tell A.J. Ellender WR/FS Davontavean Martin that. Catholic High School (B.R.) won their first state championship in the history of their school. Star football players like Clyde Edwards-Helaire, Aaron Moffitt, and Ben Miles, who all have a connection to LSU in some kind of way, were all key players in the Bears' historic run but if there was a playoff MVP for the team last season, it would be RB James Berrigan. There may be a lot of running backs that are faster, bigger, and more athletic, but there is no tougher running back than Taylor Johnson from Kinder.